The Event Horizon Telescope (EHT) is a large telescope array consisting of a global network of radio telescopes. The EHT project combines data from several very-long-baseline interferometry (VLBI) stations around Earth with angular resolution sufficient to observe objects the size of a supermassive black hole's event horizon. The project's observational targets include the two black holes with the largest angular diameter as observed from Earth: the black hole at the center of the supergiant elliptical galaxy Messier 87 (M87), and Sagittarius A* (Sgr A*), at the center of the Milky Way. The Event Horizon Telescope project is an international collaboration launched in 2009  after a long period of theoretical and technical developments. On the theory side, work on the photon orbit  and first simulations of what a black hole would look like  progressed to predictions of VLBI imaging for the Galactic Center black hole, Sgr A*. Technical advances in radio observing moved from the first detection of Sgr A*, through VLBI at progressively shorter wavelengths, ultimately leading to detection of horizon scale structure in both Sgr A* and M87. The collaboration now comprises over 200 members, 60 institutions, working over 20 countries and regions. 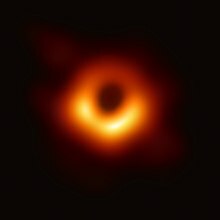 The first image of a black hole, at the center of galaxy Messier 87, was published by the EHT Collaboration on April 10, 2019, in a series of six scientific publications. The array made this observation at a wavelength of 1.3 mm and with a theoretical diffraction-limited resolution of 25 microarcseconds. Future plans involve improving the array's resolution by adding new telescopes and by taking shorter-wavelength observations. Producing an image from data from an array of radio telescopes requires much mathematical work. Four independent teams created images to assess the reliability of the results. These methods included both an established algorithm in radio astronomy for image reconstruction known as CLEAN, invented by Jan Högbom, as well as self-calibrating image processing methods for astronomy such as the CHIRP algorithm created by Katherine Bouman and others. The algorithms that were ultimately used were a regularized maximum likelihood (RML) algorithm and the CLEAN algorithm. ^ a b Doeleman, Sheperd (June 21, 2009). "Imaging an Event Horizon: submm-VLBI of a Super Massive Black Hole". Astro2010: The Astronomy and Astrophysics Decadal Survey, Science White Papers. Retrieved April 22, 2019. ^ a b c d e The Event Horizon Telescope Collaboration (April 10, 2019). "First M87 Event Horizon Telescope Results. I. The Shadow of the Supermassive Black Hole". The Astrophysical Journal Letters. 87 (1): L1. doi:10.3847/2041-8213/ab0ec7. ^ a b c "Event Horizon Telescope Official Website". eventhorizontelescope.org. Retrieved April 22, 2018. ^ Bardeen, James (1973). "Black holes. Edited by C. DeWitt and B. S. DeWitt". Les Houches Ecole d'ete de Physique Theorique. Retrieved April 22, 2019. ^ Luminet, Jean-Pierre (July 31, 1979). "Image of a spherical black hole with thin accretion disk" (PDF). Astronomy and Astrophysics. Retrieved April 22, 2019. Broderick, Avery; Loeb, Abraham (April 11, 2006). "Imaging optically-thin hotspots near the black hole horizon of Sgr A* at radio and near-infrared wavelengths". Monthly Notices of the Royal Astronomical Society. 367 (3): 905–916. arXiv:astro-ph/0509237. Bibcode:2006MNRAS.367..905B. doi:10.1111/j.1365-2966.2006.10152.x. ^ Balick, Bruce; Brown, R.L. (December 1, 1974). "Intense sub-arcsecond structure in the galactic center". The Astrophysical Journal. 194 (1): 265–279. Bibcode:1974ApJ...194..265B. doi:10.1086/153242. Doeleman, Sheperd (September 4, 2008). "Event-horizon-scale structure in the supermassive black hole candidate at the Galactic Centre". Nature. 455 (7209): 78–80. Bibcode:2008Natur.455...78D. doi:10.1038/nature07245. Doeleman, Sheperd (October 19, 2012). "Jet-launching structure resolved near the supermassive black hole in M87". Science. 338 (6105): 355. Bibcode:2012Sci...338..355D. doi:10.1126/science.1224768. ^ Shep Doeleman, on behalf of the EHT Collaboration (April 2019). "Focus on the First Event Horizon Telescope Results". The Astrophysical Journal Letters. Retrieved April 10, 2019. ^ a b Susanna Kohler (April 10, 2019). "First Images of a Black Hole from the Event Horizon Telescope". AAS Nova. Retrieved April 10, 2019. ^ a b O'Neill, Ian (July 2, 2015). "Event Horizon Telescope Will Probe Spacetime's Mysteries". Discovery News. Retrieved August 21, 2015. ^ Webb, Jonathan (January 8, 2016). "Event horizon snapshot due in 2017". BBC News. Retrieved March 24, 2016. ^ a b Davide Castelvecchi (March 23, 2017). "How to hunt for a black hole with a telescope the size of Earth". Nature. 543 (7646): 478–480. Bibcode:2017Natur.543..478C. doi:10.1038/543478a. PMID 28332538. ^ "EHT Status Update, December 15 2017". eventhorizontelescope.org. Retrieved February 9, 2018. ^ "The Hidden Shipping and Handling Behind That Black-Hole Picture". The Atlantic. Retrieved April 14, 2019. ^ Mearian, Lucas (August 18, 2015). "Massive telescope array aims for black hole, gets gusher of data". Computerworld. Retrieved August 21, 2015. ^ "Media Advisory: First Results from the Event Horizon Telescope to be Presented on April 10th". Event Horizon Telescope. April 1, 2019. Retrieved April 10, 2019. ^ Gardiner, Aidan (April 12, 2018). "When a Black Hole Finally Reveals Itself, It Helps to Have Our Very Own Cosmic Reporter - Astronomers announced Wednesday that they had captured the first image of a black hole. The Times's Dennis Overbye answers readers' questions". The New York Times. Retrieved April 15, 2019. ^ a b c "Astronomers Capture First Image of a Black Hole". European Southern Observatory. April 10, 2019. Retrieved April 10, 2019. ^ a b Lisa Grossman, Emily Conover (April 10, 2019). "The first picture of a black hole opens a new era of astrophysics". Science News. Retrieved April 10, 2019. ^ Jake Parks (April 10, 2019). "The nature of M87: EHT's look at a supermassive black hole". Astronomy. Retrieved April 10, 2019. ^ "The creation of the algorithm that made the first black hole image possible was led by MIT grad student Katie Bouman". TechCrunch. Retrieved April 15, 2019. ^ "Affiliated Institutes". eventhorizontelescope.org. Retrieved April 10, 2019.